Missed a meeting? Read about it here! 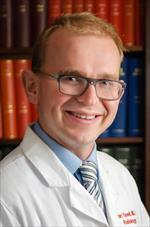 Robert Flavell, MD, PhD, is an Assistant Professor in the Nuclear Medicine subspecialty in the Department of Radiology and Biomedical Imaging at the University of California, San Francisco. He received his medical degree from Weill Cornell Medical College, and his PhD from the Rockefeller University as part of the Tri-Institutional MD PhD program. He completed his one-year internship at the Memorial SloanKettering Cancer Center in New York. Dr. Flavell completed a four-year diagnostic radiology residency at the University of California, San Francisco, where he also finished a Nuclear Medicine fellowship. In June 2016. he joined the faculty as an Assistant Professor in Residence. Solid tumors are poorly perfused and secrete acids into the adjacent interstitium, resulting in a pH which is mildly acidic, typically ranging from 6.5 – 7.0. This property has been associated with high-grade malignancy, local invasion, and metastasis in animal models. Two methods are being developed to image acidic interstitial pH, one of which permits whole body evaluation of areas of acidic pH using positron emission tomography (PET) imaging, and one method which permits quantitative, local determination of interstitial pH based on hyperpolarized 13C magnetic resonance spectroscopy (HP-MRS). The PET method is based on pro-drug glycosylamine derivatives of the commonly used oncologic tracer, [18F]FDG, termed [18F]FDG amines, which are blocked with an acid-labile protecting group. When exposed to the mildly acidic pH present in the interstitium of a solid tumor, the caging group decomposes, liberating native [18F]FDG, which is subsequently absorbed by the adjacent cancer cell. The HP-MRS method is based on the administration of a 13C labeled probe which has a predictable change in its chemical shift based on pH. By comparison to a standard curve, quantitative pH measurements can be obtained. These techniques are being optimized and ongoing directions include application in animal models, with the long term goal of clinical translation. Other areas of developing interest in the laboratory include techniques for imaging of metals in the microenvironment, and imaging of a metabolic signature associated with immune activation.